There is a golden rule that "History is always a mystery". No man or force has been able to overturn the fact. The strong presence and absence of something or someone always leaving grave marks on the mind and soul of many. 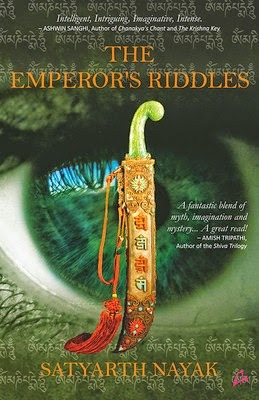 Author Satyarth Nayak in his book "The Emperor's Riddles" takes you on a journey so unknown and so grave that it can alter the course of lives. So has the author been able to capture the essence of the old? Let's find out. More terrifying than the savage murder of historian Ram Mathur on the ghats of the Ganga are the questions that follow. The letter carved on his face, the cryptic mail he sends his daughter Sia after he dies, more murders piling up. Desperate for answers, Sia turns to esoteric writer and friend Om Patnaik. But what begins as a hunt for the killer, becomes an extraordinary trail of riddles strewn across the country, that must end at the gates of an enigma. Patnaik and Sia race from one riddle to another, towards a royal secret that has remained alive for centuries. First look at the title and the cover and the long lost history dances before the eyes of the reader. The shiny sword and the eye behind it shrouded with mystery. The title adding to the dilemma and working it's way in to the curious minds. The blurb talks about a murder and few people who get dragged into the controversy. The blurb is precise and leaves no clues whatsoever and leaves everything on the readers imagination. The story starts off from the present day where Ram Mathur a well known person has been found murdered in a gruesome manner. The police and her daughter in a fix. An author Om gets his true calling when he is summoned abruptly by his dead friend and later on it all becomes a puzzle. There are no weak links and no head starts. But Om & Sia have to undertake a journey to reveal the true face behind Ram's murder. So will the duo be able to crack the code? Who will win this race of mystery? Will there be more to it than meets the eye? What awaits them at the end of the quest? That's what the story is all about. The story is like a man in a fix in the night. Topsy and turvy. There are dead ends and glimmers of hope. The adventure is enthralling. The story line smooth and simple yet convincing. The history blended with science with exemplary efforts. Some undiscovered facts and research leading to the building of the story are source of knowledge and information. The book delving in to the depth and uncovering a lot of mysteries with fiction going hand in hand. Strong character presence and enactment of the whole plot is mesmerizing. Every word and line speaking loud and speaking something new. It's a shiny new idea with a lot of gutsy deliverance. The build up and the excitement are the strong suites of the book. The downside of the book is it's weak parallel plot which works in the past but feels incomplete. The mystery getting fizzled out towards the end in lieu of a murder mystery. Historical essence being given less weight age over other aspects of the story in the second half. All in all the book with it's mystic elements and glorious myths does casts a spell on the readers. But it bleeds a lot as the parallelism and the shuffle of past and present somehow doesn't works. The present overpowering the past. The enigmatic and charismatic narration occupying the senses and letting us travel the unknown spaces of history. The book dives and dives hard but doesn't comes out unscathed. The story remarkably well woven with profound command. The promise by the storyline upheld and delivered to the readers in a lavish style. Thank you Meghant for such a detailed review. Thanks for praising the book so much. You have also raised some very interesting points and I will keep them in mind for my next book. Cheers. You're welcome Satyarth. :)... All the best for your future endeavours.